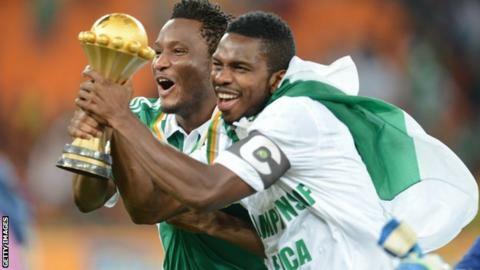 Nigeria are continuing to celebrate their third Africa Cup of Nations triumph, while Burkina Faso have spoken of their pride in reaching a continental final for the first time. The BBC's team in South Africa covered every kick across radio, television and online throughout the finals and here some of them reflect on their highlights of the tournament. Player of the tournament: He ran out of steam against Nigeria in the final but without their inspirational midfielder Charles Kabore, Burkina Faso would have got nowhere near that showpiece. I spoke to the team's fitness coach and he told me Kabore ran further than any other player in the quarter-final against Togo, but recovered quicker than anyone else before the semi-final against Ghana, when he was by far the best player on the pitch. Alain Traore's goals grabbed the headlines but Kabore made Burkina Faso tick. I'd love to see him play in the English Premier League. Team of the tournament: I had the pleasure of spending a lot of time with the Togo team in the early stages of what was a very emotional few weeks for the Sparrow Hawks. They were playing at the finals for the first time since the horrific attack on their team bus in Cabinda before the 2010 tournament. Ahead of their first match, I spoke to vice-captain Serge Akakpo, who was shot in the back during that incident, and he told me before every training session they pray for the victims. Against all the odds - and inspired by striker Emmanuel Adebayor - Togo reached the quarter-finals after a stunning win over Algeria and were unlucky not to reach the last four. Best match: The semi-final between Burkina Faso and Ghana will be remembered for an awful performance by the referee - who was suspended the day after the match - but it was great entertainment. The Black Stars took the lead after 13 minutes from a controversial penalty and after that it was end-to-end stuff. Cult hero Aristide Bance equalised, Burkina Faso's star player Joanathan Pitroipa was sent off and they had a legitimate goal ruled out. Then came the penalty shoot-out and more heartbreak for Ghana as Emmanuel Agyemang-Badu missed the crucial spot kick. Surely the most dramatic match of the tournament. Best goal: In one of the worst matches of the tournament - against Algeria in the group stage - Tunisia's Youssef Msakni came up with a moment of magic. The winger - who has been linked with Arsenal in the past - swerved past one Algeria defender and from 25 yards curled the ball into the back of the net to give his side a precious 1-0 victory against their local rivals. Favourite moment of the tournament: Interviewing an emotional Serge Akakpo in the Togo team hotel and then watching him help the team to reach the knockout stages. Also, seeing the Nigerian journalists totally lose it in the press box when Sunday Mba scored the winning goal against Ivory Coast in the quarter-final and commentating on Joseph Yobo - who was always great to interview - lifting the Cup of Nations trophy in his sixth and final tournament. Rate the hosts: The South African people were very welcoming and the stadiums were fantastic but the buzz around the tournament felt very different to a year ago when I was in the city of Libreville in Gabon. That was a much smaller place and they weren't used to hosting such big events so the excitement levels were huge. But here in South Africa it was very different, particularly in a place like Rustenburg where the attendances were poor. Having said that the atmosphere at the final was fantastic and the people of Johannesburg made it an occasion to remember. Player of the tournament: Ghana's Mubarak Wakaso gets my vote after having started the tournament without playing a competitive game and ending it as the tournament's joint top scorer. His work rate impressed in all the games that he played and he certainly didn't look out of place alongside the talents of Kwadwo Asamoah and Emmanuel Ageymang-Badu in the Black Stars' midfield. His ability from the dead ball meant that Ghana always looked a threat. But he does need to watch his discipline - getting a second yellow card against Mali for a goal celebration showed a little immaturity. He will also have to learn to cope with pressure after missing a penalty in the third-place play-off loss to Mali that would have won him the tournament's golden boot. Team of the tournament: No-one gave Cape Verde a chance going into the tournament and they proved everyone wrong from the start to the final whistle of their campaign. They frustrated hosts South Africa and silenced the partisan crowd in the opening match. They led against Morocco and looked the better team for most of that Group A match. They came from a goal down to beat Angola in the final 10 minutes. And in the only game they lost, they outplayed Ghana in their quarter-final. No-one will underestimate Cape Verde in the future and, along with Ethiopia and Burkina Faso, they proved the old cliche that there are no small teams in football anymore. Best match: After two very poor opening games in Group A, the Democratic Republic of Congo and Ghana brought the tournament to life with their 2-2 draw in Port Elizabeth. Ghana took the lead, despite looking vulnerable at the back, with a well-worked goal that Ageymang-Badu slid home after a cross from Asamoah, who later headed a goal of his own. The two strikes came five minutes either side of half-time and Ghana looked set for a comfortable win. But DR Congo's attacking threats, Tresor Mputu Mabi, Dieumerci Mbokani and Lomana LuaLua never gave up and caused the Ghana defence real problems. Mputu Mabi's neat finish and a controversial Mbokani penalty saw a highly entertaining game end all square. Best goal: Heldon's winner for Cape Verde against Angola maybe not have been the most spectacular but the celebrations it sparked and what it meant for his country make it a stand-out moment. His side were drawing 1-1 in added time and heading out of the tournament but they refused to give up and Heldon took his chance in some style to smash home a winner that put his side in the last eight at their debut tournament. Favourite moment of the tournament: Seeing Cape Verde coach Lucio Antunes racing around the Nelson Mandela Bay stadium with his national flag after the win over Angola and then the team mobbing him during the post-match press conference. He didn't let go of the flag until after he left the stadium. Rate the hosts: The stadiums were great and, as was expected, most things worked smoothly, but as always the lack of crowds was a problem. In Port Elizabeth you never really felt a buzz around the city or a sense that the tournament was happening. The much-maligned pitch in Nelspruit also really let the hosts down. Player of the tournament: Nigeria midfielder Victor Moses stood out, which wasn't difficult early on in the tournament in a Nigerian time that took its time to get going - but he was also influential when the team improved. Team of the tournament: The champions, Nigeria. Fast, flowing football from the Super Eagles whose young players have grown in stature. They were a revelation in the quarter-final against Ivory Coast and proved it was no fluke with an even better performance against Mali in the last four. Best match: Without doubt, the second semi-final between Ghana and Burkina Faso, in Nelspruit. It was an end-to-end affair and produced a defiant performance from the Burkinabe in the face of some shocking decisions by the referee. Best goal: Super Eagles strike Emmanuel Emenike's bullet for Nigeria against Ivory Coast was unstoppable, as it spurred them on to a 2-1 win over the pre-tournament favourites. Favourite moment of the tournament: Whenever the Ethiopians came to town. The best supporters I have seen at any Africa Cup of Nations tournament I have covered. Rate the hosts: The media facilities were hopeless and information was sometimes difficult to obtain. But the teams seemed happy playing in world-class stadiums - if not on world-class playing surfaces in some of them - and the locals were terrific. Player of the tournament: Burkina Faso captain Charles Kabore - a man of seemingly endless energy who powered the Stallions to the final, not least because it was frequently him who created the chances for Pitroipa, Traore and Bance up front. An exceptional talent. Team of the tournament: : The team I enjoyed watching the most were Burkina Faso - for the chances, the goal-scorers and the drama. But I think my team of the tournament has to be Nigeria, for the way they shrugged off a sluggish group campaign to see off Ivory Coast and power past Mali into the final. Some brilliant youngsters to watch out for and a team for the future. Best match: The best game that I saw in person was the quarter-final between Mali and South Africa in Durban. It was not technically the best performance from either side, but the hosts played their hearts out in the Moses Mabhida stadium, only to come to grief in the shoot-out. Bafana Bafana tried everything to break down the formidable Malian defence, who weathered it all. The Eagles knew what they were doing and did it well. Best goal: Three contenders: Sunday Mba's winner in the final, Youssef Msakni's strike against Algeria in the group stage and Alain Traore's second against Ethiopia for Burkina Faso in an emphatic 4-0 win. Traore gets my nod. Favourite moment of the tournament: The moment we realised Burkina Faso were going to make a real impact, namely Traore's late, late equaliser in the opening group game against Nigeria. A personal dislike of the trip was the moment when South African fans decided they had seen enough during the penalty shoot-out against Mali. The team had given their all but the majority of people in the stadium couldn't be bothered to stay and thank them. Rate the hosts: I thought the South African team played themselves to a standstill in the quarter-final against Mali, and their win over Angola in their second group game was great to see. South Africa keeper Itumeleng Khune stood out for his outstanding distribution, midfielder Dean Furman for his amazing work-rate and if Thulani Serero had been able to have more influence they might have looked even better. It was a grim opening match against Cape Verde, but they really improved after that - and all credit must go to coach Gordon Igesund.